Take in Fort Wayne’s Three Rivers from a thrilling vantage point. This Fort Wayne helicopter flight offers remarkable overhead views of the St. Marys, the St. Joseph and the Maumee. 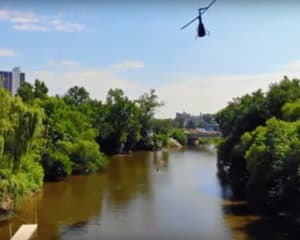 Take in Fort Wayne’s Three Rivers from a thrilling vantage point. This Fort Wayne helicopter flight offers remarkable overhead views of the St. Marys, the St. Joseph and the Maumee. From high up in the clouds, you’ll appreciate the picturesque scenery above city’s new riverfront development (phase 1 completed Summer, 2019), which includes tonnes of new green spaces and public squares, an amphitheater and a $30M project reimagining historic Columba Street as a mecca for fine dining, nightlife and commerce! Take a 12-minute Fort Wayne helicopter flight in a Robinson chopper! Appreciate impeccable views over Fort Wayne’s Three Rivers! Snap photos of the new riverfront developments. Travel into downtown Fort Wayne and be awed by the architecture. It’s a private flight, which means you’ll be seated next to your pilot and granted flawless photo opportunities. The Robinson’s wide windows ensure you don’t miss a thing. Pack your camera and book your Fort Wayne helicopter flight today!